This is a bit of a skip into the deep forest for me, as I’ve experimented to a much greater degree in grungifying the items (well, at least the papers, at this point, as I am still working with the elements). Here is where I’d like to give a big shout-out to my friend Tori, who inspired me to come up with a boys’ kit. A couple of days ago, we were chatting and she told me she was surprised that I hadn’t made a boy kit yet, given that I happen to have five sons. Good question, my friend!!! 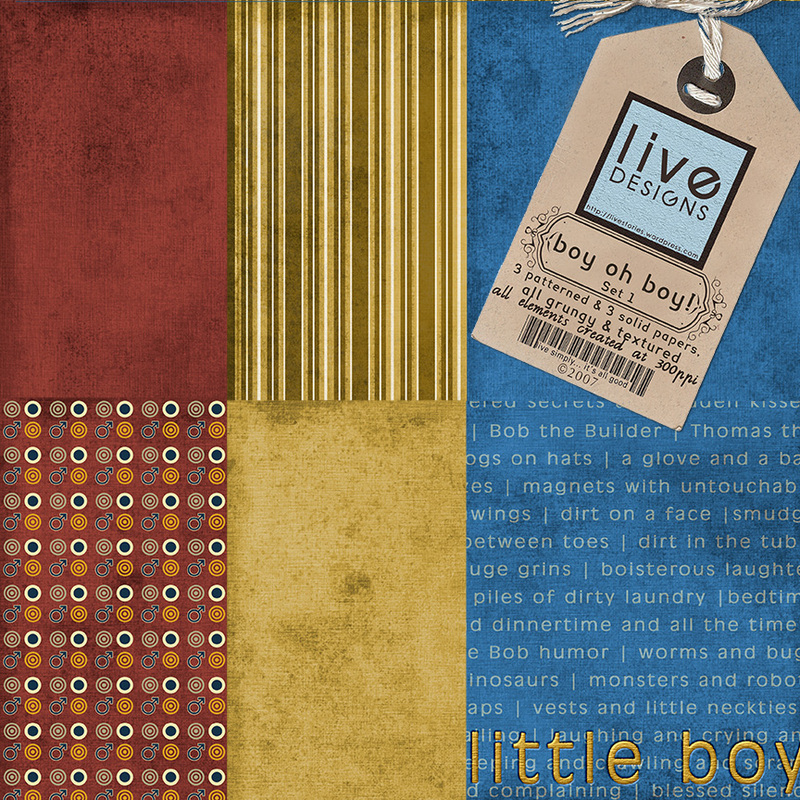 😀 So off I went to design my latest freebie: this one’s named Boy Oh Boy. For today’s freeb, I have 6 papers–3 solid and 3 patterned papers. (More coming, but since they’re large files, I kind of have to divide them to upload them…hope they don’t take forever for you to download the zips! 😯 ). I like versatile kits–those that you can use for various purposes and that don’t limit me to just the theme of the kit–I try to do the same with my freebs… so I think you’ll find various uses for the solid papers that come with this kit (uhhh… the blue text-patterned paper that comes with this set, unfortunately, is really targeted for boys as it has an embroidered design above and below that reads “the splendor and joy… of my precious little boy”). Hope you enjoy this, and I would really, really, really, r-e-a-l-l-y love to know what you think about this kit. I would truly be grateful if you could leave some comments for me… thanks so much in advance! I just found your blog. I absolutely adore your style and love this kit. I’m mom to 4 boys and this is perfect for my kiddos. Thank you so much for this beautiful freebie LivE! You always give us something special! Liv, you are amazing dahling….absolutely beautiful papers. The colours are fantastic, very similiar to a few of the fabric hues I’ve used to make some quilts. Keep on rockin on the computer!! Thanks for sharing your talent and inspiration with us all. Thanks for giving us the link to this over at NWR:) Super job with your kit! I’m off to find the other pieces. Like Veronica, I also have two boys now in their 20s. But I have lots of 20-yr-old pictures to scrap. This kit is great! The colors are so rich! They’ll be really good for the scrapbooks I am making for our boys. Thanks, Sweetie! Oh A BOY KIT! Thank you so very much… have 2 boys well now young men it has been harder to find kits that work for them. I’m in love. Please make more boy themes. I can never find enough cute boy stuff! Seriously amazing stuff here, GF!! And the divine Miss J even left you some love … I dream of her looking at my blog 🙂 Keep it comin’, girl – I do have a boy to scrap for now!! I love your freebies and specialy when it’s for kids. Thanks for sharing your talent with all of us. Have a great week-end. Liv thankyou so much for sharing your wonderful designs. They are wonderful papers, you are sooooooooooooo talented. Liv, I picked up your pile of laundry…do you want starch or no starch? Seriously though, these rock and it’s so sweet of you to think of us no matter how busy you are. Luv ya. Okay, I have two girls, but I STILL love this!!! My girls are rough and tumble as well as sweet as can be, so I know I will be able to put these to good use. Also, I do have a hubby (and a dad, and 5 brothers…LOL) Thanks so much for your generosity, Liv! Oh, and the “mini kit for Tori’s little son.” Can’t wait to see that one! 😉 You are rockin’, GF! This is SO AWESOME!!!!! I. LOVE. IT. Glad I could be a little inspiration for ya, but most of that inspiration comes from our darling boys! Ok, this is a duplicate of the comment I accidentally left under your last post. But I see a great improvement over the other paper set your offered (the one with the tires) in terms of a ‘professional’ look. These are definitely going into my download list! Liv … WHY DIDN’T EITHER ONE OF US THINK OF BOYS?!?!?!?!? Yeah, I might have wanted Pink (Thankks for Pinky Promise!) but I don’t have nearly as much to scrap Pink with. I have TONS of boy’s stuff that needs to be scrapped. Thanks! This is awesome stuff! Can’t wait to see what you come up with for the remainder of the kit. It will be awesome … no doubt! Love ya sistah!